In a land filled with mythical creatures, Cupid is the ruler of the land. The land is very happy and peaceful until one day Cupid receives a transmission from his old friend, Vladimir. Vladimir plots to take over Valentine's Day once and for all and he plans to turn Valentine's Day into Boogeyman Day. Cupid must enlist the help of his loyal minions and he will also need to seek the help of an unlikely young woman, who's willing to prove she has what it takes to save Valentine's Day once and for all. Join Cupid and his army of minions as they defeat Vladimir and his evil boogeymen and reclaim Valentine's Day once more. Simon Kang is the author of The Mouse Princess and Bad Seed. He is currently about to enter his senior year in school He has a strong interest in Alvin and the Chipmunks. He is currently working on more upcoming novels in the near future. 1. A Valentine's Day Tale: Legend of the Boogeyman: This Valentine's Day, It's War! 4. A Valentine's Day Tale: Legend of the Boogeyman: This Valentine's Day, It's War! 5. 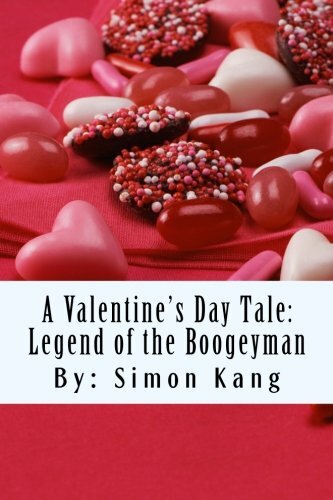 A Valentine's Day Tale: Legend of the Boogeyman: This Valentine's Day, It's War!